My eyes love the sight of vertiginous heels—my feet, not so much. 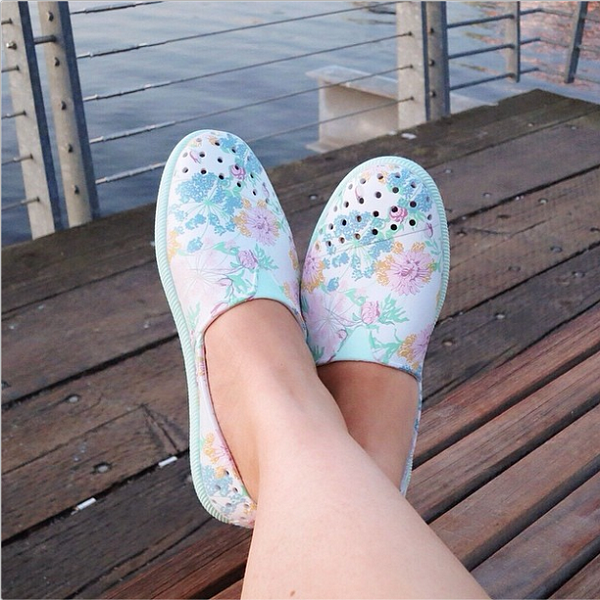 In fact, most days you'll find me in flats or low heels, and lately during my evening walks, you'll find me wearing my Native 'Verona' botanical print slip-ons. They're comfy and breathable, good for summer storms or sunny beach days; what's not to love? I got mine directly from the brand, but the good news is that you might be able to score your own (or shoes of your choice) from Canadian shoe e-tailer ShoeMe.ca, who's offering one lucky Solo Lisa reader $150 to spend on their site. ShoeMe carries 182 brands and counting, including the likes of Camper, Native, Sam Edelman, and Vince Camuto, to name a few. In browsing the site, I've been most impressed by the casual footwear selection—walkable styles that are cute and comfy. One entry per contestant. Sorry, this giveaway is open to Canadian readers only. A winner will be chosen randomly. Good luck! [UPDATE - July 23, 2014] Congratulations to @magscheung on winning! Haha pretty much! It's actually hard to tell at first glance that these are plastic shoes. How can a shoe-loving girl resist this giveaway! Personally, I prefer my Chuck Taylors to Native Shoes but I totally agree - in the summer especially, comfort is key for evenings and weekends. I'm a big fan of Chucks too. Good luck!